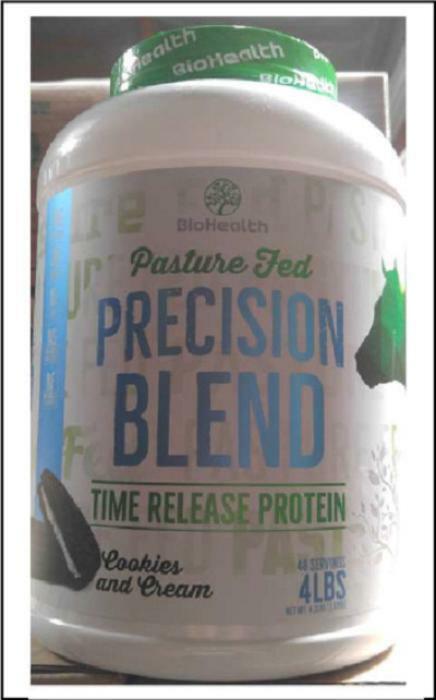 Biohealth Nutrition of San Dimas, Calif., is recalling Precision Blend Cookies & Cream. The recalled product comes in 2-lb. and 4-lb. white plastic canisters with blue lettering and an image of two dark cookies filled with cream in the bottom front panel. Customers who purchased the recalled product should not consume it, but return it to the place of purchase. Consumers with questions may contact the company at (866) 960-8789 or by email at biocorebrands.com.